When choosing a custom-made engagement ring, it is important to consider the choice of metals available, such as white gold, yellow gold or platinum, as well as the choice of precious stones – aside from solitaire or multiple diamonds, there are rubies, sapphires and other possibilities. An engagement ring is a unique symbol that carries a great deal of weight in a relationship. After all, it’s a piece of jewellery that speaks of your everlasting love and commitment, all of which makes the decision about buying a unique engagement ring a serious one indeed. The process of selecting the right style diamond ring, whether it’s from a ready-to-wear collection or custom-made by Joseph George Jewellery here in Melbourne, Australia, it should be a joyful and fun experience. So the first thing to remember is…enjoy it! For many of us, the engagement process, and that moment of diving into a flurry of decisions over whether to purchase something from a ready-made selection or a custom-made and unique engagement ring is a heady educational process and one that can come with a few pitfalls. So preparation is vital when selecting your custom engagement ring. Amidst all the excitement over a marriage proposal, it’s easy to get carried away when looking for your perfect custom-made engagement ring and can very quickly find yourself overwhelmed with too much choice. That’s why you should always set a reasonable budget before any serious ring shopping begins. Setting a budget will allow you to eliminate engagement rings that don’t fit within that budget from the start. There are no rules about what that budget should be, as this will be unique to each couple based on their circumstances. It’s best to select a ring based on what you can afford at the time. It’s almost certain that your partner already knows the style of engagement ring she would love. So keep in mind that she may prefer to choose the engagement ring herself or be part of the decision. The ideal scenario would be to involve her in the process of choosing a style, or have a consultation with your jeweller together to discuss her needs, if you are considering a custom-made design. If you want to surprise her, then the best advice would be to do your homework! While there’s a wealth of styles in engagement rings to consider when shopping for that perfect piece, one way to hone down the choices (after considering costs and personal budget) is to take a look at the kind of jewellery your potential fiancé likes to wear. Does she love white diamonds or coloured stones? 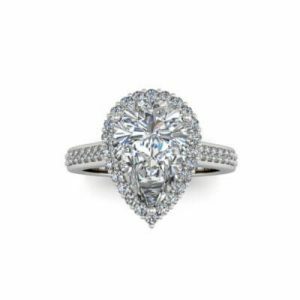 Does she prefer a classic look, modern, or perhaps it might be worth considering a custom engagement ring that reflects her individual style? If your partner generally prefers a more feminine style, then she might like the lovely flower design of the Chryssa ring. 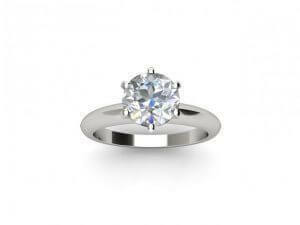 Or if she prefers a classic design, then a princess cut solitaire ring like the Hestia might be more suitable. A review of the kind of jewellery she wears, and even her wardrobe, should be an element in making the right choice. At Joseph George Jewellery in Melbourne we custom make every ring to the customer’s specifications so feel free to contact us at any time. You’re also welcome to submit photos or a sketch of the design you have in mind for a quote. We will be more than happy to guide you through the whole process with no obligation to buy, and provide you with more information about the design process and the diamonds or coloured gemstones to ensure you get the expected result.